Even with Blizzard’s recent woes with the Diablo and Heroes of the Storm franchises, one thing that never seems to die, like heroes themselves, is Overwatch, and they’re very few moments in gaming that were as big in 2018 as the Grand Finals of season 1 of the Overwatch League. 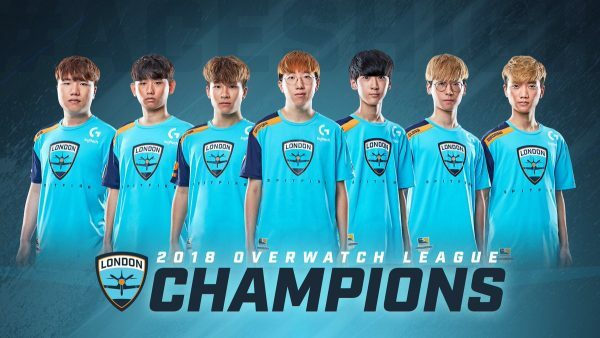 In a thrilling 3-1 final with so many awesome moments such as the infamous Orisa-halt into Hanzo-dragonstrike combo, Profit’s insane DPS play winning him the finals MVP and more Poko-bombs than fans confused by DJ Khaled being there, the London Spitfire conquered the Philadelphia Fusion to write their names into esports history. The Finals felt like a true esports spectacle, with the Twitch broadcast peaking at 350,000 concurrent viewers and a prime-time broadcast on ESPN2 meaning a sold-out Barclays Centre had pulled out all the stops. Everything from the staging, the post-match confetti and celebrations and very professionally put together broadcast crew all combined to create a final that felt ‘Grand’ in every sense of the word. Even though the result was one which most had predicted, the Spitfire and the Fusion put together a memorable, well fought final to cap off a successful first season that showed the true potential Overwatch potentially has as a mainstream esport. As someone who has a limited exposure to esports, watching the finals was such a great experience. 7 months on and we’re about to do it all over again, this time bigger and better. The first game of season 2, kicking off stage 1 starts on February 15th when we witness the finals rematch and the first stage wraps on the 17th of March. The final stage concludes on the 25th of August before we enter the season playoffs, giving us just over 6 months of OWL goodness to consume. And I have a hopeful suspicion that season may very well be better than last year. The stage format, where 4 stages take place over a season, each with their own finals (kind of a mini-league and mini-playoffs) did allow the league to be able to adapt to the ever-changing metagame and balance Overwatch has, which meant each stage last year changed the teams who were best equipped, allowing the season to never really settle. Whilst the top teams like the Spitfire, New York Excelsior and Los Angeles Valiant were always heading to the playoffs, it shook thing up for teams on the edge of the playoffs like the Seoul Dynasty and Houston Outlaws. Whilst this stage system has been maintained, some key alterations have been made to freshen up season 2. The most advertised of these is the 8 new teams joining the league, such as the fully European Paris Eternal, the pretty-in-pink Hangzhou Spark and new Canadian representation for the Toronto Defiant. All these teams added their players from the Overwatch Contenders scene, essentially the development leagues for Overwatch, along with new coaches and sweet new skins to get. The other huge announcement was the addition of new host stadiums. With all games taking place in New York last year, season 2 will introduce “Homestand weeks” in which Dallas, Atlanta and Los Angeles will host a week each in varying stages. Adding these new home games was described as a “number one thing we’re working on” by commissioner Nate Nanzer during their preview stream and adding this reach and new home games allows physical expansion of the Overwatch League, despite having to stay in the States for now. One of the less known, but most necessary changes are the changes to the schedule itself. Every team played 40 games in season 1, a brutal and intensive season which led to issues surrounding player’s mental health and fear of burnout. Various players spoke on these issues including Dallas Fuel’s DPS player ‘Effect’, San Francisco Shock’s ‘Babybay’ and NYXL’s class hitscan hotshot ‘Pine’. The most notable was the retirement of Brandon ‘Seagull’ Larned who did cite the mental toll of competitive play as one of his reasons for doing so. An attempt to negate this has been made by reducing the number of games to 28, a decision which reduces the number of games each team plays dramatically, allowing teams to prepare better for matches and hopefully, allow teams to cope better and prepare better for the demands a full esports season brings. With all this, Overwatch League season 2 has a key advantage to build hype: stories. Most sports are fuelled by ambition, athletes with the desire to succeed and with them there are natural stories created. Can the London Spitfire retain their crown with a largely similar setup? Can the New York Excelsior get over a season that they should have won to succeed here? How will the new teams fare in their inaugural season? Can the Shanghai Dragons win a game after their 0-40 season? So many intriguing questions are posed heading into season 2, and there’s only one way to find out. Prepare your antinades, get your superchargers ready and feel that healing beat, the Overwatch League is on fire, and season 2 is shaping up to be a cracker.